DevX the coworking space does much more than just providing a workspace, it is also a Startup Accelerator. DevX helps you to create an ecosystem for your startup. They support in business assistance to entrepreneurs. To keep the entrepreneurial spirit alive in youths the host speakers and influencers owners of well-known companies. They have hosted people like Jessica Livingston (YC), Vinod Khosla (Sun Microsystems), Bill Maris (Google Ventures), Ben Silbermann (Pinterest), Steve Blank and many more. 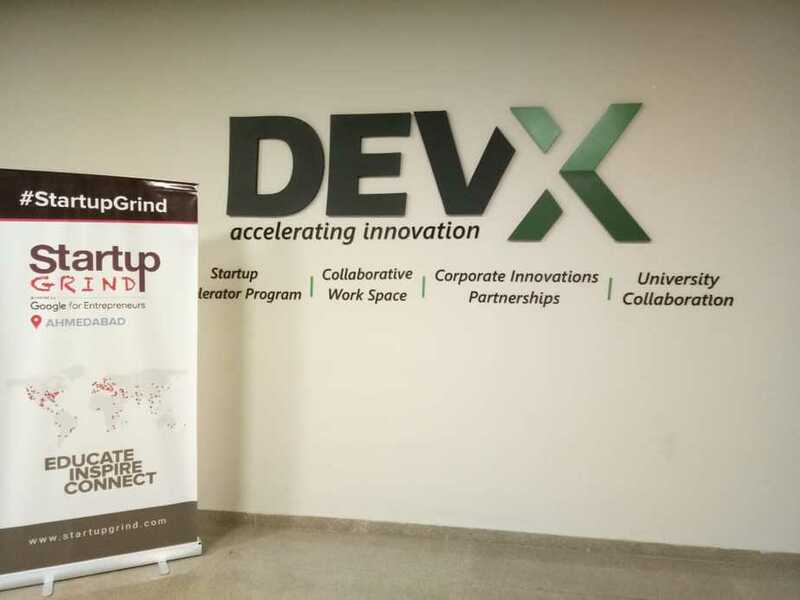 DevX launches Startup Grind Ahmedabad Chapter on February 23rd. Startup Grind is the largest independent startup community, actively educating, inspiring, has been hosted in 300 cities, across 115 countries, which is powered by Google for Entrepreneurs. 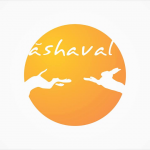 They nourish startup ecosystems in 125 countries through events, media. The foundation of their global community is monthly events featuring successful local founders, innovators, educators and investors who share lessons learned on the road to building great companies. 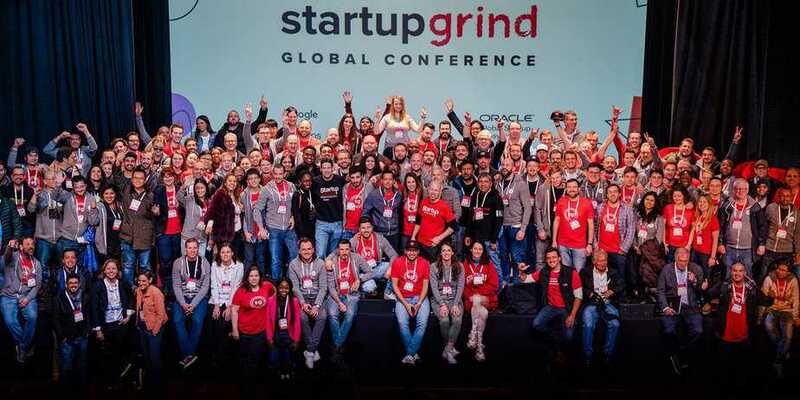 Startup Grind which founded in Silicon Valley has helped millions of entrepreneurs build their businesses, connect with strategic partners, and secure funding. 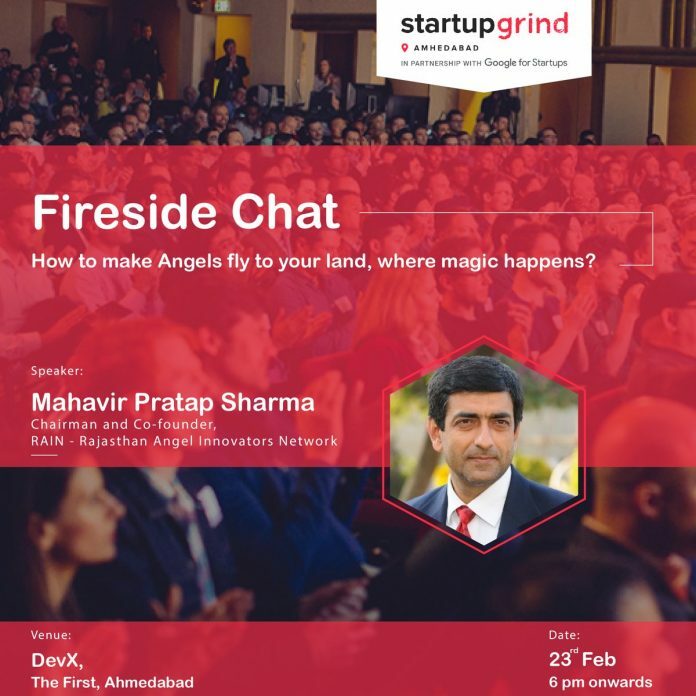 The Startup Grind Fireside Chat was hosted by DevX for the first time with MR Mahavir Pratap Singh, the founder of RAIN (Rajasthan Angel Innovators Network) as the speaker. 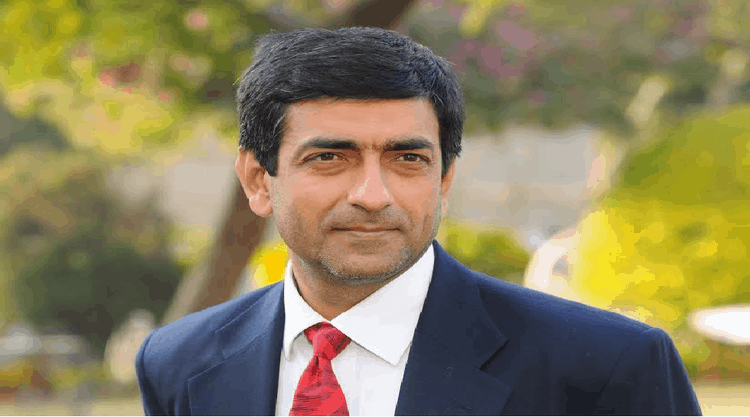 He is a serial entrepreneur and is a part of umpteen businesses and social organizations and exudes passion in angel investing, leadership and mentoring. He is an Honorary trustee of TiE Global. He’s the founder of Mata Media and marketing, Jaipur Kaleen park, SWISHin Events, Hariom Décor and Oscar Expo design and the list goes on and on. 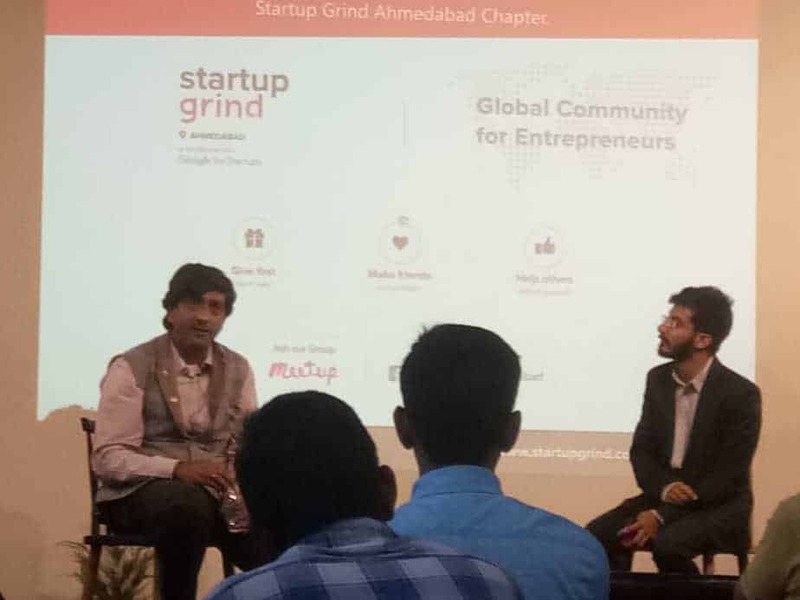 The event Startup Grind Ahmedabad’s chapter was organized with the aim to resolve the query of entrepreneurs regarding angel investing. Lalit Nagrani, the Associate person for Startup relation at DevX, hosted the event and also interviewed Mahavir Sharma. In conversation with Lalit, Mahavir defined entrepreneurs how Angel Investing works, how to choose good angel investors and what angel investor look in startups they invest. There were many other points too in the conversation as when to start looking for angel investors, factors to determine the appropriate valuation in a seed round and many such questions faced by a Startup Founder. He explained every answer very well with relevant examples. The whole conversation was for entrepreneurs and baby startups. Startup Grind events are all about helping others, giving first and making friends. Explaining the expectation of Angel Investor Mahavir Sharma told the entrepreneur audience that it is very much important to start your own startup with new ideas and a new strategy. He tells the audience to come with new ideas and not focus on their neighbours (some other domain). 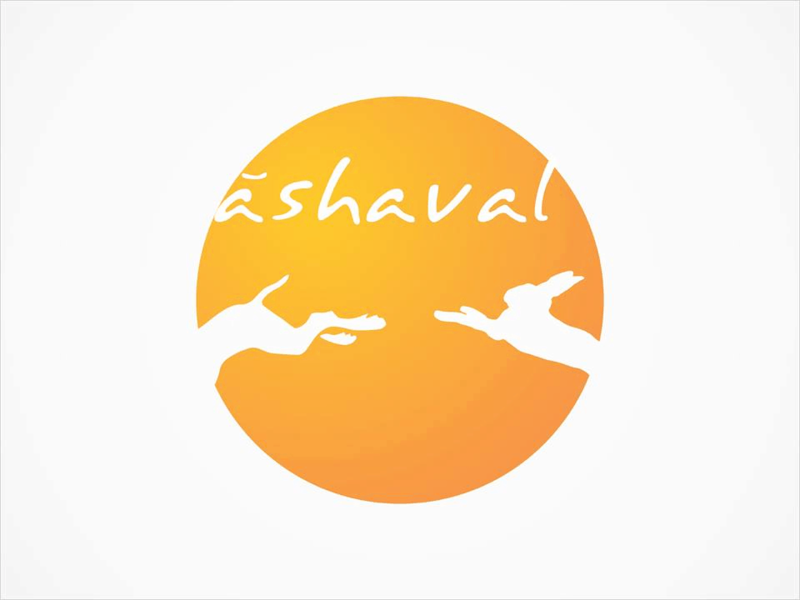 When asked what he expects from startups as an Angel investor he replied “Strong team and the ability of the team to handle the negativity surrounding them.” Mahavir checks on the team on multiple levels and says that the team should be prepared for all kind of negative questions and be damn confident about their ideas and work. “Light within you will get the right answer and nobody else will”, he further adds. “Successful startups will eventually lead to good money”, quotes the Angel Investor himself. According to him, an entrepreneur should seek a good investor. It is very much necessary for entrepreneurs to be careful and work hard with research when seeking an angel network. Entrepreneurs can try to reach out to more people, speak out to everyone about their ideas and also negotiate on the same, thus giving them much more refined ideas and an expanded network. When asked about the domains in which angel investors invest, Mahavir Sharma explains that investors are like Parents. Here you can choose your own parent, everyone has its own policy so it’s good if you choose the right parent for your startup. The quality of your investor parent should be these: they should get you and your work, They should be able to give you advice and third, is that the investors should be able to provide with your needs. With great insights from Mahavir Sharma and a great questionnaire session, the event ended on a high note. We are sure, all the startups went back with good learning about angel investments.